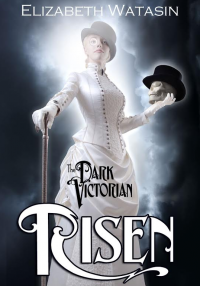 In this gothic steampunk novella, we have the pleasure of meeting Jim Dastard and Artifice, two agents for Prince Albert's Secret Commission. But they are not your standard investigators, even in this Victorian era. Jim is a cigar-eating skull who wears a top hat, while Art, his most recent partner, is a newly created ghost. This is a character-driven novella, and we learn much about Jim and Art. Though there is much more to learn about Art, as she does not know much about who she was prior to being brought back as a ghost to work for the Secret Commission. At the end of the novella, we learn about who Art's friends may have been in her first life, but I can't decide if it was an afterthought or if it was deliberately placed so that the readers were kept wondering until the end. The cover art has a graphic novel feel to it, and sets the tone of the novella. The supernatural elements of this novella are fascinating. After all, the two partners of the Secret Commission are hunting a re-animationist who has been reanimating dead children who are viciously murdering people. And it wouldn't be complete without its mediums and eldritch evils. I absolutely love the vocabulary in this novella! I'm not embarrassed to say that I had to look up quite a few words. Though Art is a ghost, she is normally as solid as a living human. She can "ghost" at will, which gives her the ability to fly and move through walls; however, she cannot do this while holding Jim. I like their resolution to this potential issue: a magical candle lit in Jim's skull while wearing one of two magical monocles allows him to see what Art sees through her monocle. With broughams, ascending rooms, gaslights, and penny-farthings, I felt the characters were grounded in their Victorian era London setting. Elizabeth Watasin knows this era well. This is a fun read filled with interesting and quirky characters, like the sapphic performers Arlette and Manon. They were introduced past the midway point, and I hope to learn more about them in the second volume.